Happy Friday! 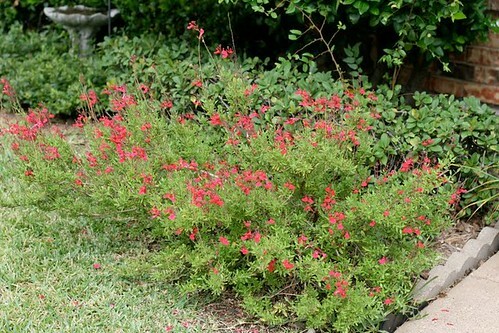 Today, I'm sharing a few things around my front porch and yard. 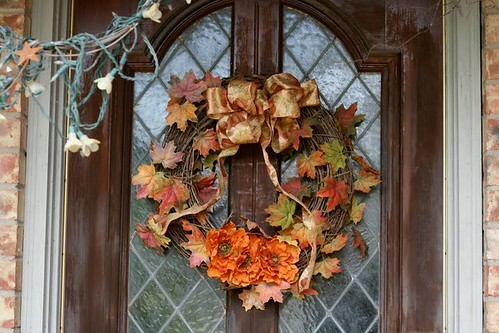 I haven't finished all of my fall decorating yet, but I have a wreath on the front door. I got this old fashioned dinner bell at Hobby Lobby this past year. This large basket holds bird seed and peanuts (for the squirrels). Since we lost our big tree this spring, I put my birdbath and feeders in the front flower bed. 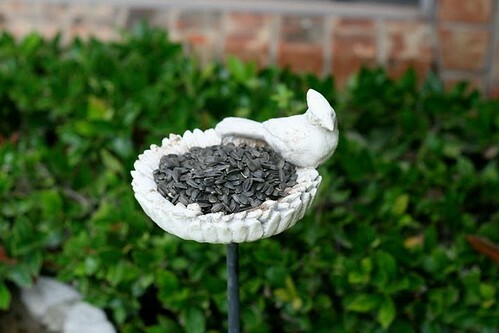 We have lots of sunflower seeds for the cardinals. Thank you for taking a look and thank you to all who join in for Show and Tell. I always enjoy seeing what you share! This weekend, the girls and I are going on a camping retreat with our Faith Keeper's group. Phillip says it isn't even close to camping since we have cabins, real beds and our meals are provided, but we are having a campfire and s'mores, so I say it counts! I'll be back next week with pictures! A very happy autumn to you! I'm still looking for inspiration for around-the-house fall design, but I'm sure some blog-hopping will do the trick. Your wreath is lovely, and I look forward to seeing what else you do in the house. Hi Kelly...your fall decor is looking lovely. I have the same Welcome plaque!! Have a great weekend. Love your wreath! I also see that we both love to feed the birds. Aren't they precious? I wished I could find such a nice bell to put outside. Sometimes when we are in the garden I can't hear the doorbell, that would be a nice solution. Love your wreath too ! I love the wreath. I still have decorating to do outside and seed to put out. Thanks for sharing. I love the way you follow the seasons decorating your home, I whish we could have the same tradition here. My daughter has asked me to see if I could get a recipe for Sweet Potato Pie (with marshmallows?) from a US blogger. You embrace fall and Thanks Giving so beautifully I thought you would be the person to ask. Do you have a favourite recipe? your porch area look wonderful! And so inviting! We have a dinner bell also...but not from hobby lobby. I don't know where ours was originally, but we found it at an antique store in Tucson. My Show N Tell is a dolphin painting this week. Have a super day and wonderful weekend Kelli!! Kelly, Your front door looks beautiful with the fall wreath. Hopefully you will have beautiful fall weather on your camping trip! Enjoy those s'mores while the birds enjoy their treats. Everything looks so pretty and welcoming! I especially like your wreath!!! I hope you and your girls have a fun weekend camping!! And, yes, it does sound like camping to me, too!!! YAY for campfires!! 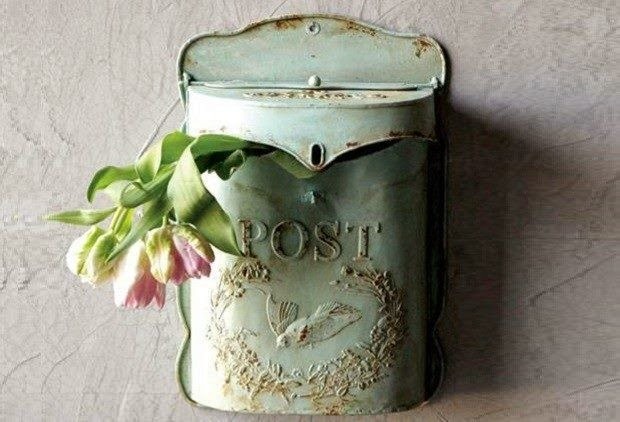 Your front door area is beautiful. I love that wreath...it says 'fall' in a lovely way! I like your bird feeders as well. I absolutely LOVE your dinner bell!! Enjoyed looking at all your pictures, but that was my favorite. Thanks for the tip, maybe I'll pay Hobby Lobby a visit and see if I can dig something simular up. :o) Thanks for sharing. Love the wreath, Kelli. I especially like the new fall header on your blog! Thanks for hosting so graciously! I have a feeder like that one. How do you keep the squirrels from chewing on the basket. We had our seed outside in a plastic tub. They chewed through the corners so we've moved it to the garage. They will chew on anything. Thanks for sharing and thank you for hosting each week. Enjoy your retreat. I say, it is camping. You'll certainly make memories. Yesterday, my daughter and I were remembering similar retreats that we went on when she was in college and I was an adult Girl Scout. Fun stuff. Hi Kelli! Sounds like camping to me. That is about as close to "roughing it" as I want to be. Explains why we have travel trailer complete with microwave, CD player, etc. etc. HE! HE! Where is Benjamin going to be? Very pretty decorations! Hobby Lobby is an awesome craft store their doll furniture is very realistic (as well as easily breakable). Everything looks wonderful, Kelli. Enjoy your camping trip! I really love your Fall wreath and the welcome plaque with the bell is beautiful. I think that is my favorite. How nice that you feed the sqirrels and birds. Have a wonderful weekend on your retreat. What a pretty area! 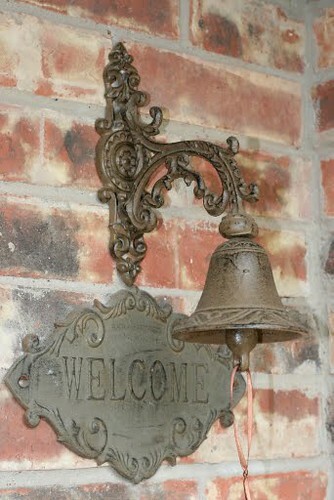 Love the welcome sign and bell and little bird feeder especially. I love the bell and the basket! I haven't been to Hobbie Lobby in a long time. Maybe I should plan a trip! Ohhh I love the bell. I wish that we had Habby Lobby!!! Beautiful. I don't have an eye for things as you do. 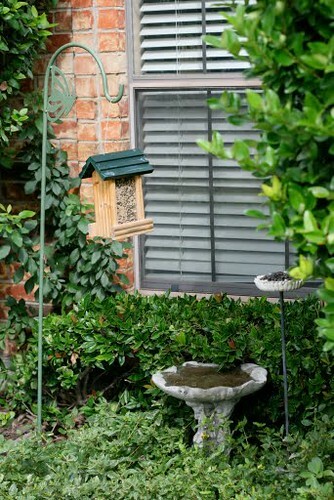 I like your bird feeders in the flower bed. I have been looking for a thrift store deal for one to put back by my bench. 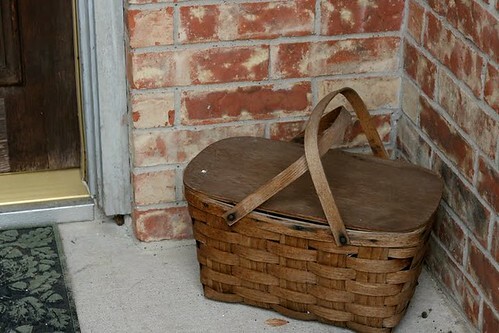 I like your basket on the porch. Do you have any trouble with it getting wet and damaging the basket? I pulled out my fall decorations this week and got a closet cleaned in the same evening. I love the fall weather. Thank you for hosting. I enjoyed looking at the things on your porch and yard. The wreath on your front door is so pretty! Have a wonderful time this weekend with your daughters! Everything looks so beautiful! I love how everything is still so lush there! We are really dying here and drying out - Utah is so quick to loose it's summer bloom. Hope you are enjoying a wonderful weekend! What a lovely welcoming front porch. Now why can't I ever find anything like that lovely bell when I visit Hobby Lobby. Wait, I know why, my hubby is following me around saying "Can we go now?" Autumn is my favorite season and I love to decorate the house in those great colors. Your wreath is lovely and I know your house must look wonderful to everyone who passes by! Your fall decor is always so inviting. So pretty! Beautiful Kelli! Makes me long for some chilly mornings here in the South. Absolutely beautiful photos of a beautiful house and yard. It is certainly interesting for me to read the post. Thank author for it. I like such topics and anything connected to them. I definitely want to read more on that blog soon.